The park features a network of five loop trails, all beginning within a two-mile radius of the parking lot. The Vista Loop Trail (yellow blaze) includes three panoramic views, a pond, a reservoir and a waterfall. The park is a popular destination for dog walking. “The Reservation,” located in Mahwah, is a popular Bergen County Park. Many visitors walk around Scarlet Oak Pond, a former gravel quarry, or climb on a wide, smooth-surface road to MacMillan Reservoir (which once supplied the Crocker Mansion on the far side of Ramapo Valley Road). It is a favorite of dog owners who exercise their pets. Ramapo Valley Reservation also offers challenging hiking. Outside the commonly used core area, the parkland has been left in its natural -- mostly hilly and rocky -- wild state, forming part of the eastern tier of the Ramapo Mountains. Several of its trails connect with those in Ringwood State Park to the west, Ramapo Mountain State Forest to the southwest, and Camp Glen Gray to the south, making possible a wide variety of rugged day-long hikes. One example, the Schuber Trail (orange; 4.7 miles + 1.8 miles from parking lot), passes through Camp Glen Gray and continues to its southern terminus at Skyline Drive. Fishing is permitted with a valid NJ fishing license. Click for a detailed description of a hike on this trail. Pond Loop (silver; loop 0.9 mile, total to/from parking lot 1.1 miles; rated “easy”) – Combine with segment of Vista Loop Trail (yellow) to circle Scarlet Oak Pond. Wide, hard-packed sand roadway that can be navigated with strollers. 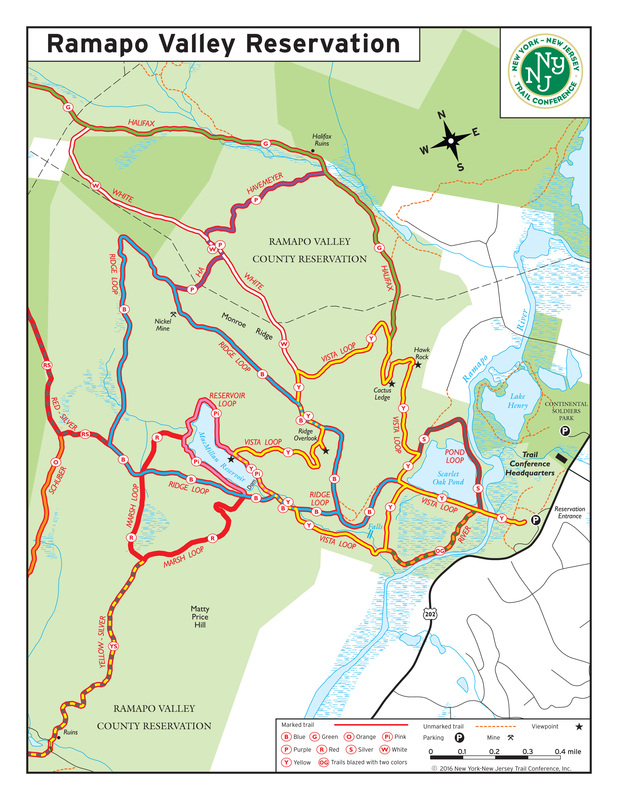 River Trail (orange/green dot, designed “OG” on revised trail map, 0.4 mile) – New trail name, incorporates 0.4 mile segment of former Schuber Trail running southwest along the Ramapo River. Schuber Trail (orange) – now begins 1.8 miles from parking lot. To reach the trailhead: Vista Loop Trail (yellow) to Ridge Loop Trail (blue) clockwise to the west of MacMillan Reservoir to Red-Silver Trail, proceed just over 0.1 mile further, make sharp left to head south on Schuber Trail. Havemeyer Trail – blazing changed from blue/white to purple to eliminate confusion with blue Ridge Loop Trail. Yellow/Silver Trail now begins off Marsh Loop Trail, 0.5 mile from MacMillan Reservoir dam. Beyond the Reservation’s “core” recreation area around Scarlet Oak Pond/ MacMillan Reservoir is an extended network of trails both within the park and connecting to other public lands. Use Web Map link near top of page. To view full descriptions of hikes in the Reservation, click here. Photographs taken along a Vista Loop hike may be seen here (October 2016). During spring 2018, a wide paved sidewalk was completed along the west side of Ramapo Valley Road from the nearby Continental Soldiers Field, where parking is available, to the Trail Conference' headquarters. From there, a wide path through the woods leads to the Reservation’s parking area and trailheads. The possibility of a quiet, beautiful, even solitary, one-mile hike around Lake Henry at Continental Soldiers Field is an added benefit of parking there. On weekends, hiker parking is also permitted at Ramapo College near its South Gate entrance, directly across from Continental Soldiers Field. A traffic light permits the safe crossing of Ramapo Valley Road to the wide sidewalk along the west side of the road. Short Line offers bus service from Port Authority Bus Terminal in New York City to Ramapo College, which is located about a half mile north of the park entrance on Route 202 (Ramapo Valley Road). Walk through the campus parking lot to the South Gate entrance and a traffic light to cross Route 202. For schedule information, go to www.shortlinebus.com (use "Mahwah" for destination, click, then select "Ramapo College" ). Limited service is available on weekends. Those hiking to MacMillan Reservoir, using the Schuber Trail (orange) to hike up along MacMillan Brook, will have noticed that the old stone cabin just over the bridge has been reduced to rubble. The reason, according to County officials: This structure was deemed unsafe. It was a haven for drinking and drug use. It was littered with broken glass, cigarette butts, drug paraphernalia, and had very obscene graffiti. People were also lighting fires which was very dangerous with the very high fire danger we were having. Too bad about the about the landmark, but the decision seems warranted.